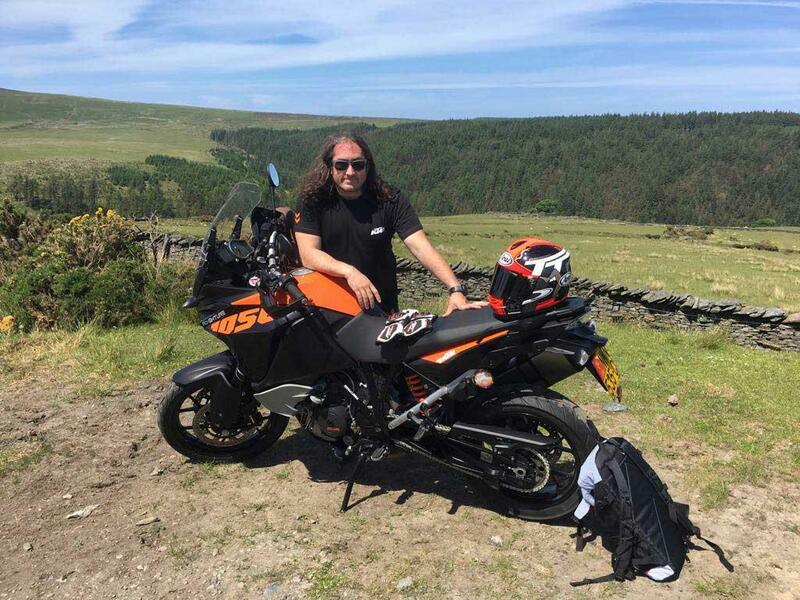 Currently on tour with his latest comedy show El Hablador, bike-mad comedian Ross Noble took time out of his busy schedule to chat to MCN about homemade enduro tracks, hecklers at the TT and bikes loved and lost. Ross first got into riding after buying a 1990 Honda City Express, just a bit different to this KTM. "At the moment, I am in Swansea in Wales as part of my 'El Hablador' tour. The tour started a couple of weeks ago and goes through to the middle of December, 2018. It’s going really good, but it’s been a busy one – with 75 dates in three months. It’s been chock-a-block!" One of those dates was at the Isle of Man TT, wasn’t it? How was that? "The TT show was great. It was funny too, because in the run-up to it my wife looked at the dates and said 'that’s in TT week, isn't it? I said 'yeah, I’m going to do the show and I’m going to stay for… five days.' We went over there and we did the show in the area behind the grand stand, which was also funny because I was surrounded by large pictures of Valentino Rossi and John McGuinness. "His mate then turned around to say that his local track is actually Laguna Seca! It was an exchange that wouldn’t have got a laugh in any other setting." So what else did you do on the island? "I hung around and got a bike and rode around the island. On the Friday, I borrowed an enduro bike and went off-roading inside the course and that was great. I think I’m going to do that again – it was perfect and you could actually get around the course to see different things. "In one of the locations I visited, McGuinness was watching there. Watching with him was like having the greatest commentary ever, however I would be lying if I said I didn’t wish he was out there racing, instead. "I’m sure he was just enjoying the racing and enjoying the sunshine, but it was like having your own expert to ask questions whenever you wanted. You really can’t get better than that!" Last time we spoke to you, you regretted selling your BMW R1150GS. Have you regretted selling anything else recently? "I lost between 10 and 12 bikes when my house burned down, so pretty much all of my toys were wiped out in one go! I did have a Ducati Hypermotard SP, which I regret selling. I went in the shed one day and just thought 'I’ve got too many bikes.' You’re just constantly having to sort out paperwork and MOT them and I wanted to get rid of some of my collection, however I now wish I hadn’t got rid of it. "I also had a Suzuki Hayabusa and that was a bit of fun. I probably shouldn’t have got rid of that either, but it was unnecessary! "I did actually buy back a 1990 50cc Honda City Express pizza bike, which I used to ride on a car licence when I first moved to London. I used to do big trips on it and it was the bike that actually got me into riding. "I was doing a TV show where they reunite you with your old cars and bikes and a guy turned up with it. In a rush of nostalgia, I bought it straight away and rode it back home from London to Kent, which was quite a trip!" You’ve recently moved house, but we heard you had something very special in the garden at your last home? "I had my own track! I had a dirt track in the field with jumps and stuff and then I had an enduro loop through the woods. You could link the two together and, alongside that, I also had an extreme enduro area and a big trials area. "I got 100 tonnes of rock and then I got a digger and dug out a big s-shaped trench to practice my trials training. I also got railway sleepers and concrete to add more features, too. "The way I designed it, you could go through the enduro loop, onto the track and then onto the extreme enduro stuff, before finishing up on the trials section. With a few hours of that, you really don’t need to go to the gym!" You spend a lot of your time in Australia now. What’s the riding culture like over there? "I spend around half my time in Australia because I tour there and I tour here. The thing with Australia is you’ve got lots of long, straight roads, so you get lots of people riding Harleys and larger cruiser-style bikes and it sort of makes sense – a bit like having a convertible car. "The adventure bike scene is also big over there because you’ve got thousands of kilometres of desert to ride in. Off-road riding is also a lot more accepted over there. However, what I also found is that trials is just not a thing over there! "To off-road rode here, you have to be committed because of the poorer weather, access and conditions, whereas in Australia it’s much better, so more people have dirt bikes and often so will their children. It seems a lot more socially acceptable for kids to ride motorbikes in Australia." So what’s in the garage now? "You know what, when I sold my house, I had a real cull and sold a lot of my cars and bikes. I do however still have my four trials bikes and a KTM 300 two-stroke. I’ve just sold my KTM Super Adventure, and plan to get one of the new 1290 Super Adventures when there’s time. I’ve got my pizza bike, too." I see you’ve just joined Instagram. When are we going to see some lovely pictures of your bikes on there? "You know what, as soon as this interview is published, I will start putting some bike pictures up there, so make sure follow me at: mrrossnoble." Well, there you have it. You best get following! And if you're feeling inspired, have a browse for your next bike on MCN Bikes For Sale. Bumper Christmas MCN on its way!